It is extremely important to know how to live our daily life. We need to know what is spiritual practice and what is not spiritual, or what is Dharma and what is not Dharma. The benefit of understanding this, of having this wisdom, is unbelievable, is infinite. What we have to realize is that all of our activities throughout twenty-four hours – walking, sitting, sleeping, talking, doing our job – can become a cause for enlightenment, for liberation, for happiness in future lives; or for the lower realms. It all depends on our motivation. Drinking just one mouthful of water, the one action of drinking water, can either become the cause of enlightenment, the cause of liberation, the cause of future happiness or the cause of suffering in the lower realms. 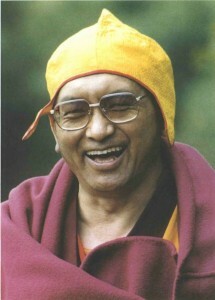 So we should think this way: if I drink the water with the motivation of bodhichitta – the thought of wanting to achieve enlightenment for the benefit of sentient beings – however, many mouthfuls I take from one glass, however many glasses of water I drink, each one becomes a cause of enlightenment for all sentient beings, a cause for the happiness of all sentient beings. However, if I drink this water with attachment that clings to this life, then each mouthful, each glass of water, becomes only the cause of suffering, the cause of unbearable suffering in the lower realms – not to mention the cause of problems in the human realm….